Steven Clake has revealed to us that he had a deal to contest the EMX250 championship in 2019 with Assomotor Honda. However, when the new age rule hitting the class it left the Brit without a deal. 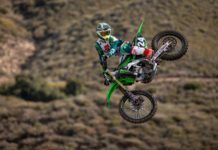 Clarke started getting in contact with people in America and was able to agree a deal with the Ti Lube Honda Racing team to contest the east coast Supercross series. After spending the last few years in the GP paddock, Clarke will be hoping for some good results in SX this year. “The deal all came about thanks to the stupid age limit change in mxgp. I had a sweet deal set up for 2019 with the Assomotor Honda team, I lined up to try to win the EMX250 title again but after the change, I had nothing on the table. I contacted some people over here in America and fortunately got myself a deal with Ti Lube Honda Racing for east coast SX”. “My expectations are to get myself in the top 5 and on a podium during the season. I’d like to thank Ti Lube Honda Racing for their last minute opportunity to run me on their team and obviously my parents for always being behind me. Also, a big thank you to Colleen Millsaps and everyone at MTF”. “My set up for 2019 is the new CRF250 and I’ll be running factory connection suspension as always. They got a great suspension setting and I’m excited to get out at the races”, Clarke exclusively told GateDrop.com.